New plugin requires "very little knowledge about programming"
Is Plug'n Script the new rock 'n' roll? 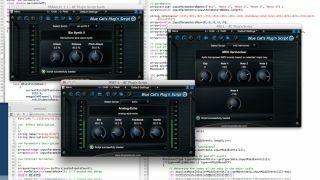 If you've always dreamed of creating your own effects and instruments but haven't known where to start, Blue Cat's Plug'n Script could be the answer. Operating as a plugin - which means you can do your building work from the comfort of your DAW - Plug'n Script is said to require "very little knowledge about programming," which sounds promising if you've got plenty of ideas but no idea how to turn them into reality. What's more, you can run existing scripts (46 come included) and those written by others, so you could get something out of this plugin even if you don't use it to create anything yourself. The supplied scripts cover audio and MIDI processing, virtual instruments and utilities. Plug'n Script is available now for PC and Mac and in all major plugin formats. You can currently buy it from the Blue Cat Audio website for the discounted price of $74/€59.